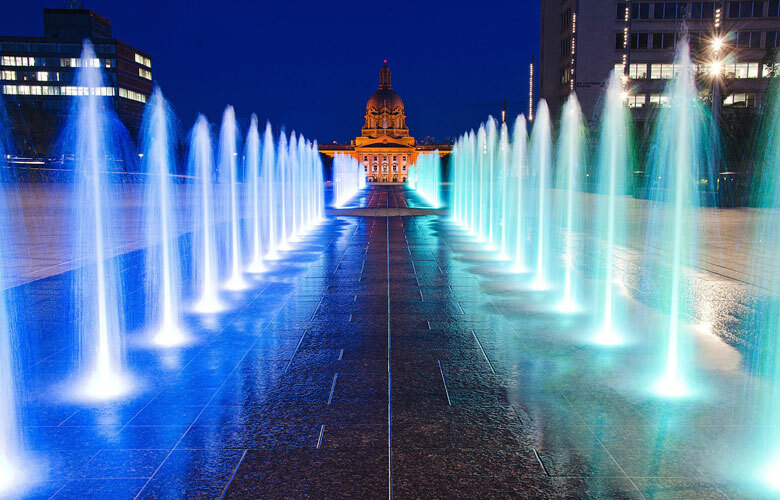 Capture the best the city has to offer at these 8 picturesque locations. When you live in Edmonton, you recognize there are certain times of year when our city’s beauty truly shines. In the spring, when cherry blossoms dot the downtown corridors; in the fall, when trees are suddenly flush with reds, oranges and yellows; and in the winter, when snow covers the city in a blanket of white. For budding photographers, the challenge becomes how to capture this beauty and share it with the world. Edmonton City Hall: While there’s much to gaze at when visiting Edmonton City Hall, its most stunning features by far are the two steel and glass pyramids that cover the main atrium and the council chambers. Plenty of natural light allows for stunning indoor photos, but there are many other backdrops to choose from. Snap some shots next to the 200-feet tall Friendship Tower or the crystalline blue fountain (which turns into a skating rink in the winter). The Leg: The Alberta Legislature Building is a haven of mixed media, with marble pillars and carved oak intertwining along its structure. Play with the various textures by taking both macro shots and portraits. Don’t fail to capture the iconic image of the plaza’s main walkway, which is lined with glittering fountains that create an ethereal corridor. The End of the World: This spot at the top of the river bank on Saskatchewan Drive offers breathtaking views of the river valley below. It also overlooks west Edmonton, providing views of Quesnell Bridge and The Edmonton Valley Zoo. Because the area has been an unofficial (albeit somewhat sketchy) photography destination for years, the City is now constructing an official lookout station to improve safety at the location. Gallagher Park: Also known as Connors Hill, Gallagher Park sits on the downtown edge of Edmonton, just along the river. Use Muttart Conservatory as the perfect backdrop to your photos or wait until nightfall to capture shots of the glittering city skyline. Union Bank Inn: Someone you know getting married? Taking new headshots? Snapping a profile picture? Whatever the occasion, Union Bank Inn is an excellent outdoor location for portraiture. This historical building, formerly known as the Union Bank of Canada, is lined with red brick and unique design elements, making it an excellent backdrop for both individual and group shots. The Muttart Conservatory: Edmontonians sure like their pyramids. Reminiscent of the Louvre in France, the Muttart Conservatory is defined by striking glass pyramids rising from the river valley. Venture inside and transport yourself to any of four biomes filled with rich plant life, where you can take vibrant photos of flora no matter the season. Devonian Botanic Gardens: If you’re willing to venture a little further outside of the city, you’ll be rewarded with over 200 acres of alpine and cold-hardy plant life. The authentic Japanese Garden provides the perfect backdrop to close-up photos of the garden’s inhabitants, or take some selfies on the traditional bridge next to the water feature. Gold Bar and Capilano Park: Escape to nature along the Gold Bar and Capilano Loop Trail, which winds around both parks next to the North Saskatchewan River. This is an ideal location for hiking, walking and bird watching, so bring a bag of bird seed and challenge the kids to spot as many creatures as they can. The photos you capture of the family exploring nature and feeding the wildlife are the kind you’ll have for a lifetime. Once you’ve filled up your memory card, you’ll want to upload your photos as soon as possible. Uploading and downloading such large images onto the cloud requires a lot of data, but the TELUS PureFibre network‘s recent expansion into Edmonton may be the answer. TELUS’ 100% fibre network allows for equally fast downloading and uploading at 150 Mbps, so you can download 20 photos from the cloud in just 18 seconds or upload a 1.5 MB photo to social media in less than a second. That means less time in the studio, less time worrying about your files and more time capturing the best sights in Edmonton.